In a joint statement with the United States, Britain, France, Germany and Gulf Arab allies, Turkey said Russia's actions constituted a «further escalation» of the conflict and would only fuel more extremism. Russia's decision to join the war with air strikes on behalf of Syrian President Bashar al-Assad this week, and the increased military involvement of Iran, could mark a turning point in a conflict that has drawn in most of the world's military powers. On the other hand hundreds of Iranian troops have arrived in Syria to join a major ground offensive in support legitimate government of Assad. A sign the civil war is turning still more regional and global in scope. To understand the depth and the global nature of the conflict, it is necessary to turn to geopolitics. A milestone in this sense seems Erdogan's visit to Moscow. 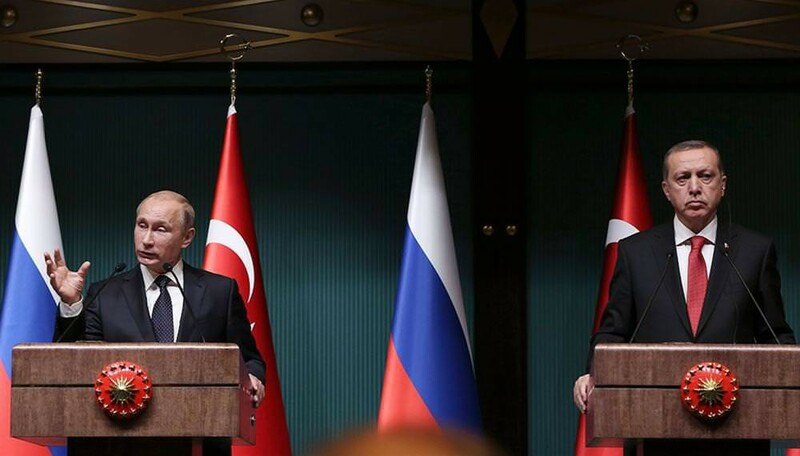 On the eve of his visit to Moscow, Erdogan said that his first plans is aimed to discuss with Vladimir Putin the two most important issues which are agreement for Turkish Flow and the situation in Syria. To this day Turkey's policy remains ambiguous in terms of the balance between the Atlantic and Eurasian poles. As a sovereign state, the country sees great potential in cooperation with Russia. But as an ally of the United States she is in favor of the overthrow of the government of Bashar al-Assad in Syria. It seems both Russia and America to have to deal with this dichotomy. Erdogan can hardly be called as consistent one. This political plays exclusively in the interests of Turkey. Since last November, he forbade the US to use Turkish bases for airstrikes against «Islamic state.» A month later, in December, Erdogan states about the turn of South Stream to Turkey. In April of 2015, Erdogan demanded an apology from Russia over the Crimea after Putin's words about the genocide of Armenian people. And in July 2015 th he has allowed the US to use its bases to fight against LIH. But in September, Erdogan again criticized the Western countries for the war in Libya and Iraq. And in relation to the Turkish Flow the policy remains ambiguous. The unexpected decision of Ankara on this project caused a scandal in Europe. In December last year, Turkey has declared its readiness to build a gas pipeline with Russia, which was refused by the European Union. But the timing of the project launch is constantly postponed. Experts believe that through the tightening process Turkey is trying to get political dividends from the West. After all, a Turkish relationship with West is so tense. No matter how different the position in foreign policy, the sovereign interests of Turkey remain in the first place. Despite the involvement of NATO, Turkey is not a puppet state as European countries. Ankara is ready to defend its interests, even if they run counter to the political ambitions of its allies. This position is understandable for Russia. Therefore, the relationship can be on a rational basis. But which way Turkish interests will be turned in the next moment? Russia and Turkey are located on opposing sides in the Syrian War and the threat of direct military confrontation is becoming more than real one.